Ottaviano Del Turco (born 7 November 1944) is an Italian politician. Del Turco was born in Collelongo on 7 November 1944. After a career in trade unionism in the Italian General Confederation of Labour (CGIL) Del Turco rose to the top of Bettino Craxi's Italian Socialist Party (PSI) before it was swept away in the Tangentopoli scandals of 1992-94. Del Turco was the president of the Antimafia Commission from December 1996 to May 2000. He was minister of finance in the cabinet led by the then prime minister Giuliano Amato from 2000-2001. He was elected to the European Parliament in 2004 on the Italian Democratic Socialists (SDI) ticket and sat with the Party of European Socialists group. On 20 July 2004, he was elected chair of the committee on employment and social affairs at the parliament. On 4 April 2005 he won the election as president of his native Abruzzo as candidate for centre-left coalition The Union and on 1 May resigned his seat in the European Parliament to take up this post. In 2007, he left the SDI and became a member of the Democratic Party (Partito Democratico, PD) – Italy's largest opposition party. He was a member of the 45-strong national council. On 16 July 2008, he resigned as President of Abruzzo and left the national council of the PD. On 14 July 2008, Del Turco was arrested on suspicion of involvement in a 12.8M euro fraud in the financing of the public health system of his region. He was not charged with a crime, but was suspected of corruption and criminal association, prosecutors said. He was among 10 people arrested or placed under house arrest. Del Turco was sentenced to nine and a half years in prison for his involvement in the exchange of health sector bribes. He was convicted by a court in the city of Pescara on Monday 22 July 2013. The sentencing was in connection with a major 15-million-euro (USD 19-million) fraud in the financing of the public health system. In addition to the jail term, he was ordered to pay more than 3 million euros in damages and given a lifetime ban on holding public office. ^ "Ottaviano Del Turco". European Parliament. Retrieved 6 June 2013. ^ a b "Former Italian minister arrested". BBC News. 14 July 2008. Retrieved 15 July 2008. ^ "European Parliament appoints President, Committees chairs and Commission President". CPME. 24 July 2004. Retrieved 6 June 2013. ^ "April 2005". Rulers. Retrieved 6 June 2013. ^ "July 2008". Rulers. Retrieved 6 June 2013. ^ "Italian governor is held on corruption charges". International Herald Tribune. 14 July 2008. Retrieved 15 July 2008. Umberto Veronesi M. D. Veronesi was born in Milan. He obtained his degree in medicine from the University of Milan in 1952, after spending brief periods in England and France, he joined the Italian Cancer Institute in Milan as a volunteer. He contributed to breast cancer prevention conducting studies on tamoxifen and retinoids and he was an activist in anti-tobacco campaigns. In 1994 he founded the European Institute of Oncology, which he directed until his death and he was appointed President of the Scientific Committee of the Italy-USA Foundation in 2010. In 2009, through his foundation, he started the project Science for Peace,1993 member of the national Commission against cancer. 1998 member of the national Commission for the evaluation of Di Bella therapy against cancer, 2000-2001 Minister of Health under the Amato II Cabinet. On 25 April 2000 he was appointed to the Amato II Cabinet as the minister of health and was in office until 11 June 2001 and he was instrumental in the promotion of the anti-smoking in public places act. The Democratic Party is a social-democratic political party in Italy. The partys acting leader is Matteo Orfini, who replaced Matteo Renzi after his resignation in February 2017, in April–May the party will hold a leadership election and Renzi is again running for secretary. The PD was founded on 14 October 2007 upon the merger of various centre-left parties which had part of The Olive Tree list. The PDs main ideological trends are thus social democracy and the Italian Christian leftist tradition, the party has been influenced by social liberalism, which was already present in some of the founding components of the DS and DL, and more generally by a Third Way progressivism. Following the 2013 general election and the 2014 European Parliament election, the PD was the largest party in the Chamber of Deputies, the Senate and the European Parliament. From 2013 the Italian government has been led by three successive Democratic Prime Ministers, Enrico Letta, Matteo Renzi, and Paolo Gentiloni. As of 2017, other than the government, Democrats head fourteen regional governments out of twenty and function as coalition partner in Tuscany. Former bigwigs include Giorgio Napolitano, Sergio Mattarella, Romano Prodi, Giuliano Amato, Massimo DAlema, Pier Luigi Bersani, Francesco Rutelli, the coalition, in alliance with the Communist Refoundation Party, won the 1996 general election and Prodi became Prime Minister. In February 1998 the PDS merged with minor parties to become the Democrats of the Left, while in March 2002 the PPI, RI. In the summer of 2003 Prodi suggested that the forces would participate in the 2004 European Parliament election with a common list. Whereas the Union of Democrats for Europe and the far-left parties refused, four parties accepted, the DS, DL, the Italian Democratic Socialists and the European Republicans Movement. They launched a joint list named United in the Olive Tree, the project was abandoned in 2005 by the SDI. In the 2006 general election the list obtained 31. 3% of the vote for the Chamber of Deputies, eight parties agreed to merge into the PD, Democrats of the Left Democracy is Freedom – The Daisy. Pietro Sandro Nenni was an Italian socialist politician, the national secretary of the Italian Socialist Party and lifetime Senator since 1970. He was a recipient of the Stalin Peace Prize in 1951 and he was a central figure of the Italian left from the 1920s to the 1960s. He was born in Faenza, in Emilia-Romagna, after his peasant parents died, he was placed in an orphanage by an aristocratic family. Every Sunday, he recited his catechism before the countess and if he did well and he affiliated with the Italian Republican Party. In 1908, he became editor of a paper in Forlì. The socialist paper in the town was edited at the time by Benito Mussolini, Nenni was imprisoned in 1911 for his participation in the protest movement against the Italo-Turkish War in Libya with Mussolini. When the First World War broke out, he advocated the intervention of Italy in the war, in 1915, he volunteered for the Isonzo front. 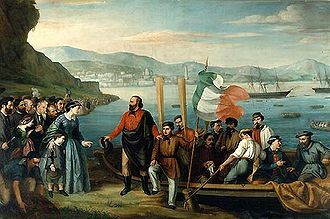 After he was wounded and sent home, he became an editor of the republican paper Mattine dItalia and he defended Italys participation in the war but tried not to alienate his socialist friends. 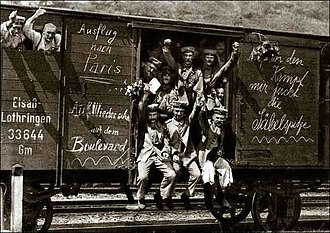 In the last years of the war Nenni served at the front again, when the war was over, he founded, together with some disillusioned revolutionary ex-servicemen, a group called Fascio, which was soon dissolved and replaced by a real Fascist body. 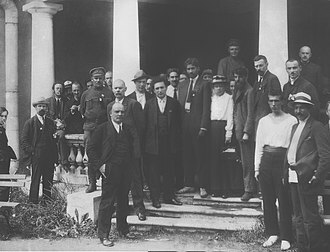 While the socialist Mussolini became a fascist, the republican Nenni joined the Socialist Party in 1921 after its split with the wing that would form the Italian Communist Party. In 1923 (after the Fascist March on Rome, he became the editor of PSIs official organ, Avanti. 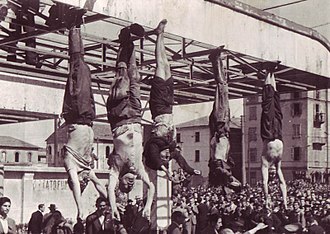 in 1925 he was arrested for publishing a booklet on the fascist murder of Socialist leader Giacomo Matteotti. When the Avanti offices were set aflame and the paper prohibited in 1926, he took refuge in France, in Paris, where he had worked as correspondent of the Avanti in 1921, he became acquainted with Léon Blum, Marcel Cachin, Romain Rolland and Georges Sorel. Nenni went on to fight with the International Brigades in the Spanish Civil War and he was the cofounder and the political commissar of the Garibaldi Brigade. He has been a Member of the Chamber of Deputies since 2006. Letta was Minister of European Affairs from 1998 to 1999 and Minister of Industry from 1999 to 2001, Letta is a founding member of the Democratic Party, formerly he belonged to Christian Democracy, Italian Peoples Party and The Daisy. His uncle is centre-right politician Gianni Letta, a advisor of former Prime Minister Silvio Berlusconi. After spending part of his childhood in Strasbourg he completed his schooling in Italy at the liceo classico Galileo Galilei in Pisa and he has a degree in political science, which he received from the University of Pisa and subsequently obtained a Doctorate at the SantAnna School of Advanced Studies. Letta began his career in the party Christian Democracy, the dominant center right Roman Catholic party. In 1998, he was appointed Minister of European Affairs in Massimo DAlemas Cabinet at the age of 32, in 1999 Letta became Minister of Industry. Having been a member of the Democratic Party in 2007, Letta stood in the first leadership election. During the next election of 2009, he supported the eventual winner, Pier Luigi Bersani. 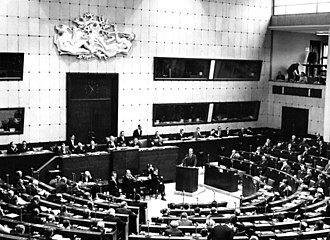 The government he formed became the first in the history of the Italian Republic to include representatives of all the major candidate-coalitions that had competed in the election. His close relationship with his uncle Gianni Letta, one of Silvio Berlusconis most trusted advisors, was perceived as a way of overcoming the hostility between the two opposing camps. Letta appointed Angelino Alfano, secretary of the People of Freedom, Letta was formally sworn-in as Prime Minister on 28 April, during the ceremony, a man fired shots outside Palazzo Chigi and wounded two Carabinieri. On 14 June 2013 Letta promotes a summit at Palazzo Chigi with Ministers of Economy and Labour of Italy, France, on 15 June, the government issues the Decree of doing, measure aimed at hiring policies for economic recovery. 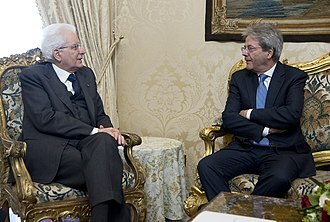 On 17 and 18 June, he participated in his first G8 at Lough Erne in Northern Ireland, the next day, Letta had a meeting with President Napolitano to take stock of the possible alternatives. Sergio Mattarella, OMRI, OMCA is an Italian politician and judge who is the 12th and current President of Italy since 2015. He was a member of Parliament from 1983 to 2008, serving as Minister of Education from 1989 to 1990, in 2011, he became an elected judge on the Constitutional Court. On 31 January 2015, he was elected by parliament to be the 12th President of the Italian Republic and he is the first Sicilian to have held the post. Sergio Mattarella was born in Palermo of a prominent Sicilian family, Sergio Mattarellas brother, Piersanti Mattarella, was a Christian Democratic politician and President of Sicily from 1978 until his death in 1980, when he was killed by the Sicilian Mafia. During his youth, Sergio Mattarella was a member of Azione Cattolica, in 1964, he graduated in law at the Sapienza University of Rome, after a few years he started teaching Parliamentary procedure at the University of Palermo. Mattarella entered politics after the assassination of his brother Piersanti by the Mafia, in 1985 Mattarella helped the young lawyer Leoluca Orlando, who had worked alongside his brother Piersanti during his governorship of Sicily, to become the new Mayor of Palermo. In 1990 Mattarella was appointed Vice-Secretary of Christian Democracy and he left the post two years to become director of Il Popolo, the official newspaper of the party. Following the Italian referendum of 1993 he drafted the new electoral law nicknamed Mattarellum, in the ensuing 1994 general election Martinazzoli was again elected to the Chamber of Deputies. Following Buttigliones appointment, Mattarella resigned as director of Il Popolo in opposition to this policy, Mattarella was one of the first supporters of the economist Romano Prodi at the head of the centre-left coalition known as The Olive Tree in the 1996 general election. 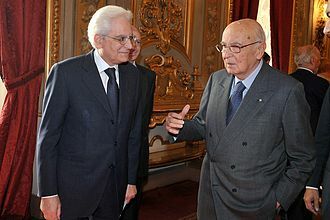 After the electoral victory of the centre-left, Mattarella served as President of the PPIs parliamentary group, after the resignation of DAlema in 2000, Mattarella kept his position as Minister of Defence in the government of Giuliano Amato. In October 2000 the PPI joined with other centrist parties to form an alliance called The Daisy, on 5 October 2011 he was elected by the Italian Parliament with 572 votes to be a judge of the Constitutional Court. He was sworn in on 11 October 2011 and he served until he was sworn in as president of the Republic of Italy. Mattarella was officially endorsed by the Democratic Party, after his name was put forward by the Prime Minister Matteo Renzi, Mattarella replaced Giorgio Napolitano, who had served for nine years, the longest presidency in the history of the Italian Republic. His first statement as new President was, My thoughts go first, Mattarella stated that Europe and the world must be united to defeat whoever wants to drag us into a new age of terror. Candidates run for election in 100 multi-member constituencies with open lists, on 7 December 2016, Prime Minister Matteo Renzi announced his resignation, following the rejection of his proposals in the 2016 Italian constitutional referendum. On 11 December Mattarella appointed the incumbent Minister of Foreign Affairs Paolo Gentiloni as new head of the government and he was married to Marisa Chiazzese, daughter of Lauro Chiazzese, a professor of Roman law and rector of the University of Palermo. Enrico Letta receiving U.S. Secretary of State John Kerry in Rome, 2013. Enrico Letta and his wife with President of Mexico Enrique Peña Nieto and First Lady Angélica Rivera. Bersani at the Festa de l'Unità, the official festival of the Democratic Party. Romano Prodi was the leader of L'Unione, having won the primary elections. 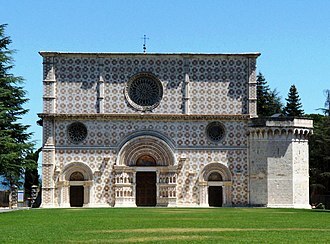 Church of Madonna del Rosario.